Did you know that one of the synonyms of 'stuff' is 'impedimenta'? Yes, I looked that up, but it's been clear to us for a while now that stuff is an impediment. Impedimenta is "baggage or other things that retards one's progress". Maybe you also didn't know that one of the antonyms (opposites) of 'experience' is 'ignorance'. About 2 years ago, Deb and I decided to ditch the baggage, reduce the ignorance, and start working on those experiences, and we've never been more happy with a decision in our lives. We're actually not as anti-stuff as we probably have made it seem. We are fans of stuff that truly makes your life easier in areas that really matter. 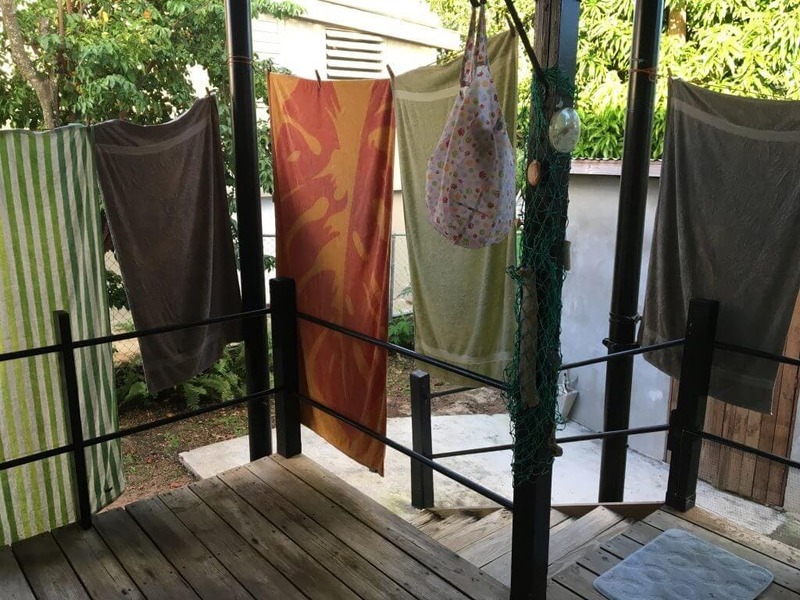 So, what about a clothes dryer? We have a washer, but we've found that we like not having a dryer. Instead of being a slave to that dryer buzzer (no wrinkles! ), we hang the clothes and go to the beach or the store, and get the clothes later. A dishwasher is different. Having lived without one for the last year and a half, we certainly see the utility of it every day when we do the dishes. We are fortunate to have the time to wash them by hand, and we don't see this changing any time soon so we resolve to be happy with what we have. And then there's the microwave oven, which is somewhere in the middle. On one hand it would be nice to have because we cook a lot & reheat leftovers. On the other hand, we don't really have the counter space and it's actually not a big deal to live without, so we consider this almost a luxury item. Neither of us are into uni-taskers though; once you've listened to our friend Alton Brown on this subject (click that link and watch the video - it's good!) you may question whether you can live without those can't-live-without gadgets after all. And we are into stuff that enables activities and adventures. Think snorkels and paddleboards and kayaks for example. Hiking flip-flops and bicycles even, and a cheap car to haul this stuff, that makes sense to us. So with our (greatly reduced pile of) stuff we are swimming along in life enjoying our adventures, and bathing in experiences we otherwise wouldn't have had. 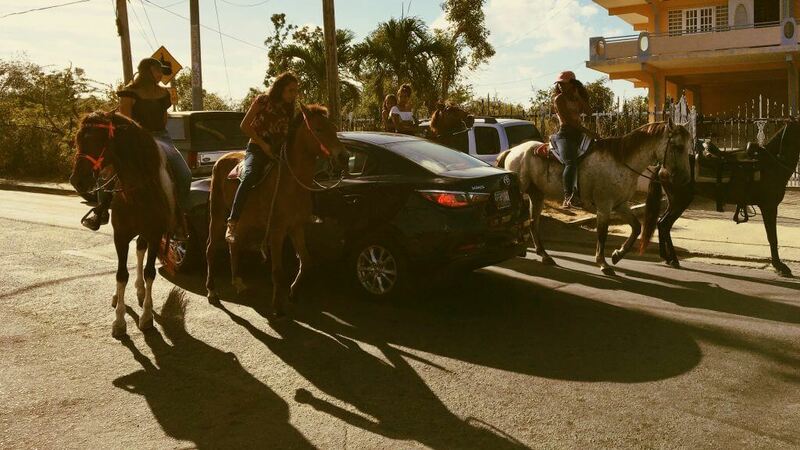 We live in a neighborhood of Viequenses who speak almost all Spanish, with roosters crowing every morning, and horses clop clop clopping down the street day and night. We have a neighbor who comes by to get breadfruits from our massive backyard tree, and a four year old boy with a big smile who runs 2 houses down to greet us when we get home from a day at the beach. There's an old man across the street who talks to us in Spanish, and if we don't understand he will speak each word, one by one, until we get it! There are other Viequense friends who speak pretty-good English to us and we speak pretty-bad Spanish back to them. We have great experiences with these wonderful people, people who are a little different from us. This is something we couldn't have done if we'd stayed in our big house with the big yard, driving our nice cars, and drinking world-class craft beer. That's a non-sequitur, sorry, but I really do miss the world-class craft beer scene of Colorado! Back to the point of this post - we chose to pursue new experiences and to meet new people on this little island we found on the Internet. 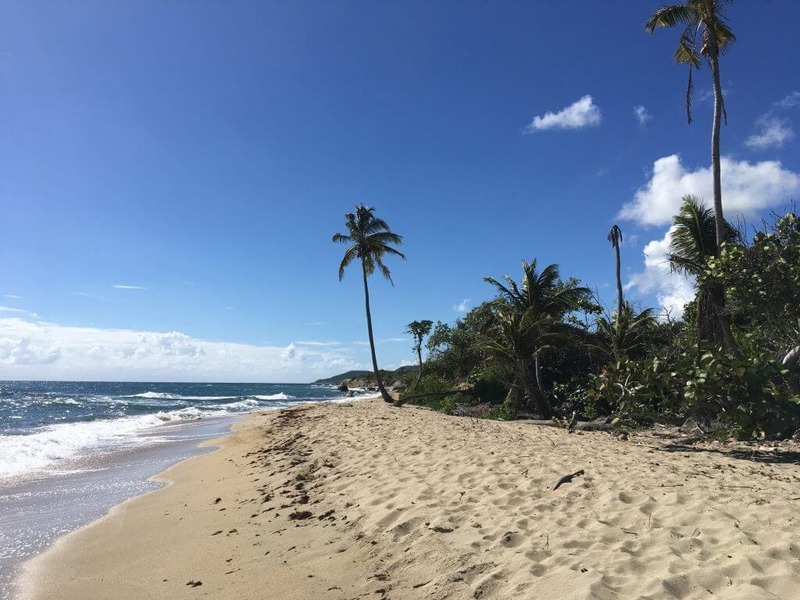 It goes without saying that our access to beautiful beaches has improved about a million percent since we moved from Colorado to Florida and then started hitting places in the Caribbean. This location gave Deb a chance to get past her fear and jump off a pier into the crystal blue water. It gives both of us, if not daily at least weekly, the opportunity to go into situations where we aren't entirely comfortable, and speak in a language we aren't very good at. When we're done, we find that it wasn't a big deal, but we're also a little bit proud of ourselves. That's an experience! And of course we get our beach walks in places where it's actually hard to find another human being, or even footprints (unless they are horse hooves). 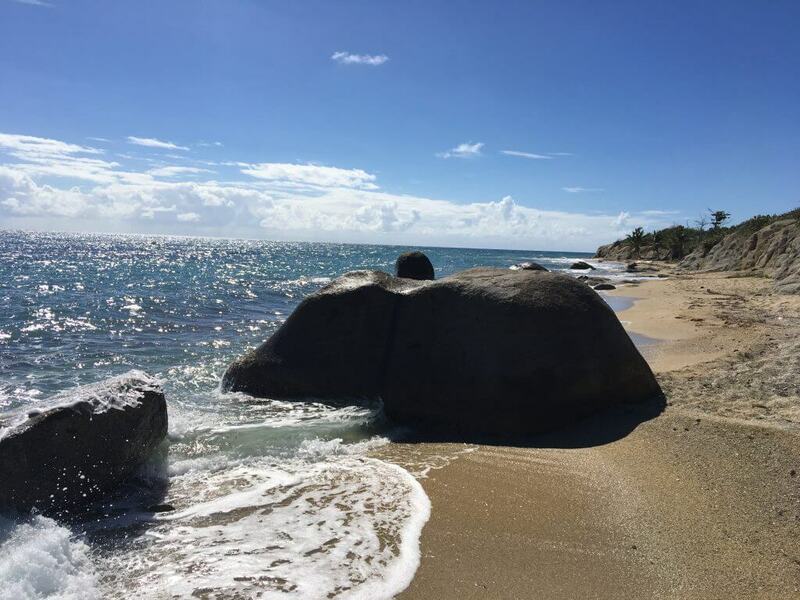 The simple act of driving around Vieques is an experience as well. We've talked about the potholes ad nauseum, and they really are worth writing home about. And there's pothole chicken, where two cars head right at each other in the same lane until the guy on the wrong side gets past his potholes and steers back to his side. The joke goes something like this: "In the States, they drive on the right. In the Virgin Islands they drive on the left. In Vieques, we drive on what's left." But there's more to driving here than just potholes. There's an older guy we know who may not have a gas pedal on his car. He literally drives around the entire island at idle. One day Deb was jogging from our house down to the vegetable stand and I was going to pick her up there in the car so we could run some errands. She took off before me and I gathered some things and got the car out. About halfway there I saw a funny sight. She was jogging along and this neighbor was puttering along in his little car at 5mph behind her. There was a mini-traffic jam as he took forever to simply pass a jogger on the side of the road. She wasn't in his way, that's just the speed he drives! And then there are the real traffic jams. 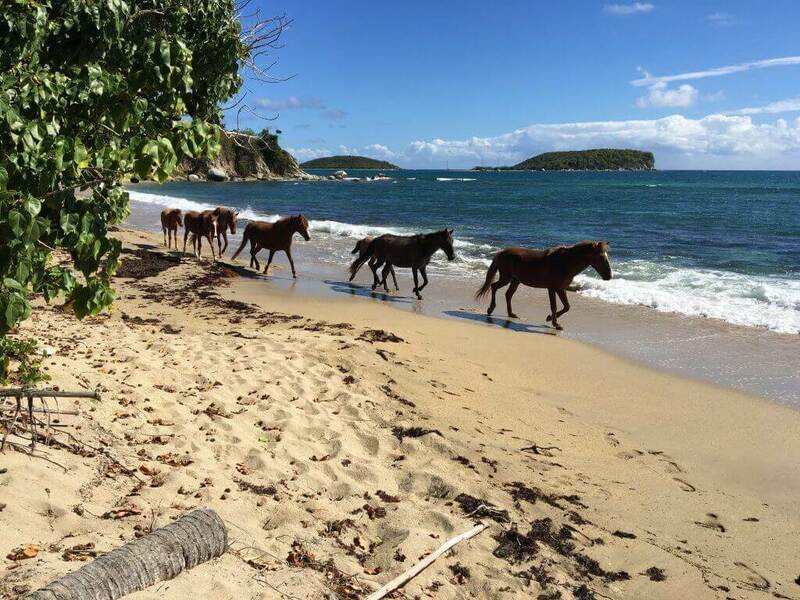 There are two kinds of traffic jams on Vieques. Horses and Chatting. 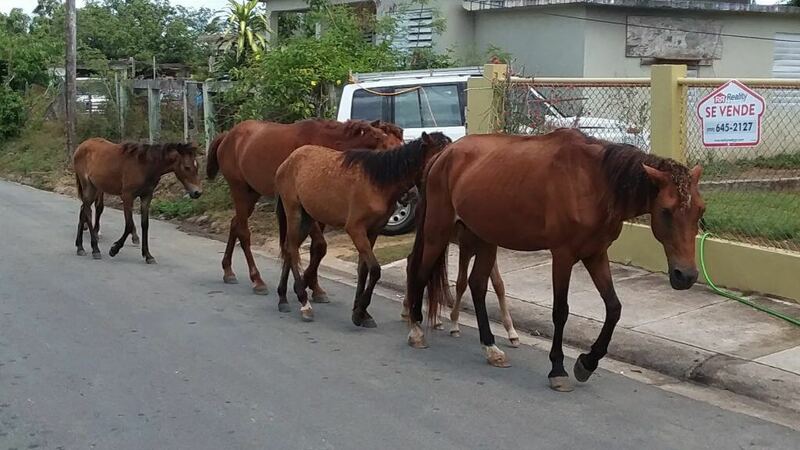 The loose horses sometimes gather in large teams and end up on the streets. And sometimes it's just a kids' equestrian club. It's OK, you take your time and work around them slowly because you really don't want to spook a two-thousand pound animal. The other type of jam is all about chatting up your friends and family. It's perfectly acceptable to stop your car on the main road to just talk. We've done it ourselves, but maybe only for a few seconds up to a minute, not for several minutes like the locals will do. People behind just sit and wait patiently, and we do too. Deb says she loves this tradition because it really shows what the people value, and it's not getting everywhere in minimum time. We're staying in our lane! There's also what I call the Vieques fire drill. Again, on the main road into town, in this case both directions of traffic are stopped. Why? Because Mom and Dad are in different cars going opposite directions after someone picked up the kids at school. They both stop their cars, and stop traffic. The kids get out of one car and hop into the other one. We sit and watch and wait, and when they're all loaded up, we all go again. That's Vieques! Part of this is Puerto Rican culture and part of it is that truly small town life in a place with somewhere south of 9000 people. We actually spend more time in the water than we do in traffic, thankfully a lot more. One day we went to one of our favorite beaches, which has another smaller beach that you can wade through the water to get to. This day we were snorkeling in the area between the beaches, around a rock outcropping, and we saw some conch on the bottom. We went on our way but soon we were talking about making a conch salad. So we went back and struggled a while to find them, they don't always sit still, but we eventually did. We took two of them home and made a conch ceviche salad. It was not without a fair bit of learning (thank you youtube! ), but we managed and we did enjoy the fruits of our labor. We also decided that we'd need to get better at cleaning conch if we want to do this often! Another day we were in our kayaks, planning to go to an offshore reef about a mile out and do some snorkeling. But we had a bailout plan and it's good that we did. About halfway out we were coming into some good sized swells. They were probably only about 2 feet, but that's pretty big in a tiny little kayak. So we bailed out to a tiny protected sandy beach we saw across the bay. It was perfectly calm and pleasant and we crossed a small reef area on the way in. Once we landed and got settled, we snorkeled back out there and saw an entire cast of "aquarium fish", Blue Tangs and Stoplight Parrot Fish, Angelfish, Glasseye Snapper, and many more; it was truly beautiful. We also saw hundreds of sea urchins and one lone Nassau Grouper that made me want to go back and catch it with a speargun or a rod and reel. Then I found out this species is Critically Endangered. My ignorance of this fact is an example of my advancing age - when I was a kid growing up Florida these things were so common they ended up on every dinner table in the state. But now they are overfished, rare, and illegal. But now, simply by being here, by showing up and going on an adventure, we got to see one of these beauties up close and personal. 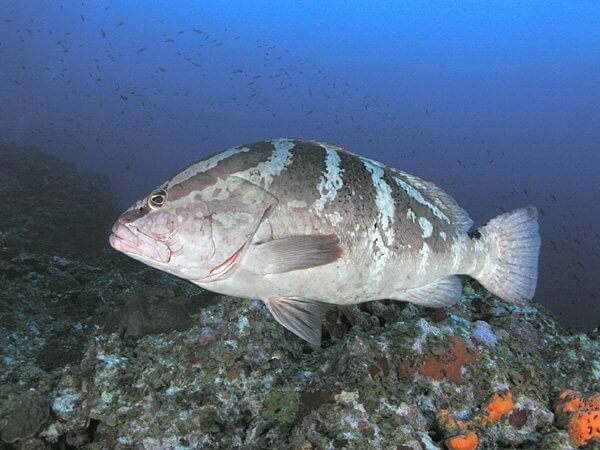 Have a good life you delicious looking grouper, and make lots of babies! 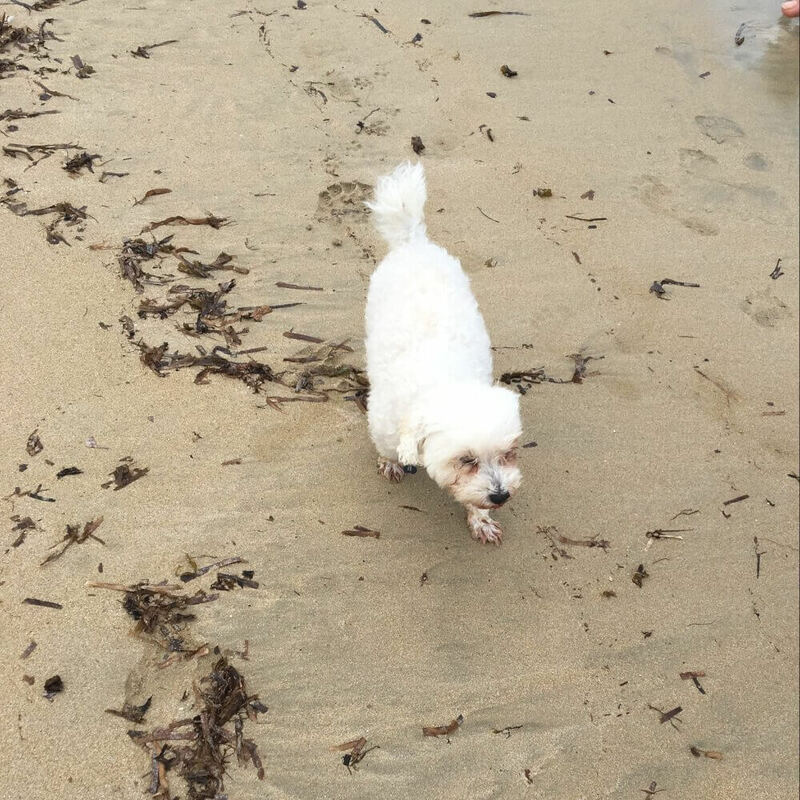 Just last week we were walking the dogs on what we call Dog Beach and met an old local fisherman we knew about. He first offered us some "Vieques apples". I'm not sure exactly what they are but they look and taste about like an apple, but they are the size of a cherry and have one large seed inside. Next thing you know he was regaling us with stories of the U.S. Fish & Wildlife guys laying down rules he doesn't agree with, and talking about how these stones in front of us are not native to Vieques, maybe they were ballast stones from Spanish galleons, and how the point here used to have a lot more fish, and he went on and on. He also gave Deb a shell and told her how to make it into a nice clip for a sarong, and then handed her a stone for cleaning the skin. We loved his stories and had nowhere to be, but the dogs did! Eventually Maxwell forced the issue, telling us in his outside voice that we needed to get walking down that beach! And not all of our fun experiences are with Viequenses - we really spend more time with the great stateside friends we hang with. We have a weekly Friday night happy hour, because you know we have to relax after a hard week at work! And we have a randomly recurring event with friends, that we call a "stroll". It's really a bar crawl but "stroll" sounds so much classier, doesn't it? Also Vieques is a great place to stroll, with these great folks, making more great experiences! There are different groups of friends as well, who gather every Sunday at the beach for Sunday Funday, a tradition among Viequenses and transplants alike. They bring food and drink, sometimes grilling meats, boiling crabs, or frying fish right on the sand. The kids play in the water, and the adults play dominoes and chill. Sometimes they also knock down coconuts, open them with a machete, and pour rum in them! Last week we did another hurricane cleanup - this time it wasn't a beach, it was in the mangroves in the bay, with locals and statesiders alike (we all paddled out in kayaks). It's a great community event to help the island, the wildlife, and the people who live here. Later this week we're going to a pig roast at a friend's house, another island tradition. It's safe to say we love all our friends here! In short, we gave up stuff for living life and making new friends. 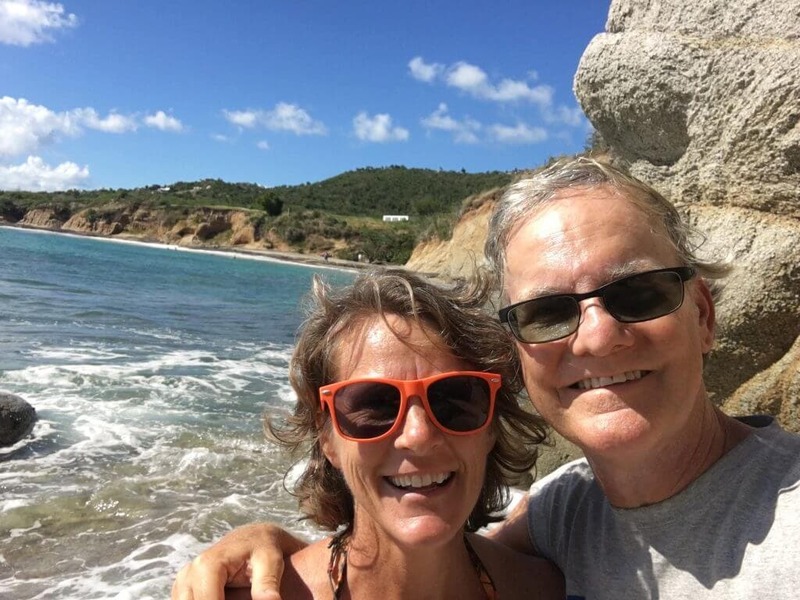 We originally came to Vieques for the beaches, but the people we've met make us want to stay longer and longer. Where it all ends, well, I'll let Uncle Jimmy tell it. TODAY'S SPECIAL: "Son of a Son of a Sailor" by Jimmy Buffett. "Where it all ends I can't fathom my friends. If I knew I might toss out my anchor." Thanks Catherine, and thanks for following along! As always, a great entry. Thanks for letting us live your dream with you. Keep up the good work and the good life. Good story of the “apples”. There is something else here called a “beach apple” which is called the most poisonous plant on Vieques. But I don’t think the old man gave us one of those! We’ve been visiting Vieques yearly for 8 years, missing last year due to surgery recovery. I enjoyed your beaches post and enjoyed exploring new beaches because of it. I’ve kept my eyes open for you and your pups as we have our little dog, Alice with us…she, too, loves to explore!!! Your directions are very detailed and spot on!! Thanks for all your efforts!! Also, please update Punta Arenas status to ‘Now Open’!!! We’re just now leaving this beach. Hi Jenny, glad to hear we’re not the only ones hauling our dogs around the Caribbean! I’m working on Punta Arenas RIGHT NOW, thanks for the update! 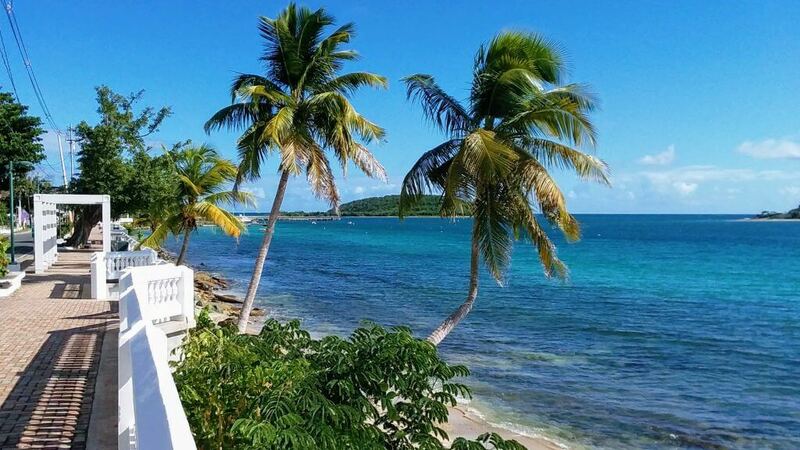 Vieques is my happy place! Your blog is very informative and fun to read. Thanks for sharing! Thanks RhondaSue, so glad you’re enjoying it! I’ve just started reading your blog posts and am finding all kinds of tidbits. Thanks! My husband and I are thinking of moving there. We’ve visited twice, and are coming again in April. We will not be retiring, though, ( we’re in our 50s) and will need income. Do you have thoughts on that—are jobs available? Customer service is fine, I’m a teacher, but don’t speak Spanish yet (and probably never will enough to teach), do you know people who work remotely? I totally understand if you don’t have a feel for this, but figured I’d give it a try. Thanks for your posts and for the beach guide. Keep on keepin’ on. Thank you Chris! Jobs are a challenge here but I don’t want to discourage you either. We have not been in the job market so we’re no experts on that, but I would say most stateside people here do one of three things: open their own business, work in restaurants (and some in hotels), or work remotely. Sorry, I don’t have any inside tracks. Good luck and maybe we’ll see you on the beach in April. No worries, Norm. That’s kinda what we expected. Regardless, it’s fun to think about living on the island, and even more fun to visit. Thanks for getting back to me.